One of the first truly affordable hybrids, a used Honda Insight makes for a great choice for Middletown and Mechanicstown drivers. Not only does it have a hybrid powertrain for a solid fuel economy, but it’s well equipped and has the savings that already come with used cars. We’ve had our fair share of Insights here at Middletown Honda, though, and we know that they aren’t all the same. Here’s a quick preview of what you could expect from your used Honda Insight. Revamped for 2010, the Insight has quickly become more famous for what it did well for a decade: offering drivers an affordable and well-equipped hybrid. 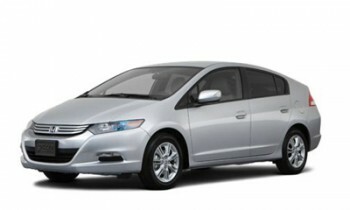 The latest model, the 2014 Honda Insight, represents the epitome of these updates. Many drivers have opted to upgrade, though, and we typically see LX and EX trim levels coming in with added features, including options like satellite-linked navigation and Bluetooth phone and audio streaming. These models should all qualify for Honda’s Certified Pre-Owned program as well, giving you added warranty coverage for peace of mind. The initial Insight was quite different than it is now, but it received an update partway through that made it more like the current model. Some drivers might seek out those early models, though. They have some of the best fuel economies in a small car. Would you believe that early manual transmission models were rated by the EPA for as much as 52 mpg in mixed driving situations? That bests many current hybrid models nearly 15 years later. Features were a bit sparse on early models, with only one trim level available, but a CD player and options like automatic climate control mean that drivers probably won’t notice any difference from most modern vehicles. If you want to see what used Honda Insight models we have available, contact us at Middletown Honda today. Or just drop by our showroom at 520 Route 211; we’re just a short drive away from Mechanicstown and have an inventory that really should be experienced in person. *41 city/44 hwy/42 combined mpg rating. Based on 2014 EPA mileage ratings. Use for comparison purposes only. Your mileage will vary depending on driving conditions, how you drive and maintain your vehicle, battery-pack age/condition, and other factors.